Newark Avenue, the long beleaguered shopping district in the downtown, is getting a new store: a convenience store. TwentyFour 7 is replacing Gas, a men’s boutique store that had a shelf life of about three weeks. 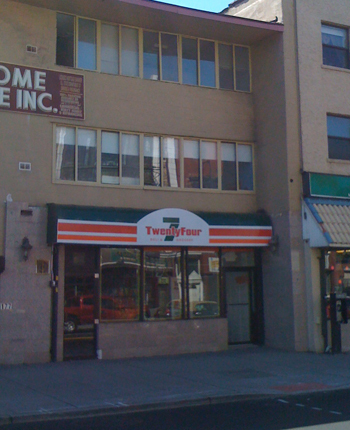 Don’t tell 7-Eleven corporate though, because the store’s signage looks remarkably similar. Across the street, adjacent to the former Ox restaurant is another convenience bodega grocery that opened last year, and a block further east on Newark is yet another that opened at about the same time. These new stores join long time favorites Grove Newstand and Downtown Newstand all within a two block stretch of Newark Avenue.